Jennifer Swanson Lowe is a partner at Geodesic Capital. Prior to joining Geodesic in 2015, Ms. Lowe spent 16 years as an equity research analyst, most recently at Morgan Stanley, where she led the firm’s coverage of the application software space. For most of the past five years, investors in private and public software companies prized revenue growth above all else. Investors were more than willing to overlook near-term profitability (or lack thereof) in favor of an acute focus on growth. As a result, entrepreneurs were encouraged to invest in building massive sales teams as quickly as possible to accelerate revenue growth, regardless of the cost. In late 2015 and early 2016, stock market volatility reverberated through private markets. Investors refocused on profits as they worried about the financial strength of portfolio companies, and entrepreneurs feared the loss of access to additional capital. Consequently, we saw significant downward pressure on valuations for many unprofitable businesses, even ones that still displayed attractive revenue growth. Today, investors and entrepreneurs are feeling more optimistic following a number of recent successful technology IPOs, including Twilio, Apptio, Coupa and Nutanix. However, we believe profitability will remain a critical part of the valuation discussion going forward, as most of today’s public markets investors favor companies that strike the optimal balance between growth and profits. We analyzed more than 80 publicly traded software companies and concluded that growth alone is no longer a strong predictor of company valuation. Instead, profitability and growth both influence the price investors are willing to pay. This relationship is captured by looking at the sum of revenue growth and cash flow profitability, a new metric we call “Profit-Adjusted Growth” or PAG. Our analysis shows that today, PAG is a better predictor of software valuations than growth alone, and we expect this to continue as investors refocus on businesses best conditioned for long-term success. The post-financial-crisis era for software companies has been marked by two coincident phenomena: (1) relatively easy access to capital; and (2) upward pressure on valuations for the highest-growth businesses. These factors have influenced both investor and company behavior. The fastest-growing companies attracted the most capital, and companies were encouraged to plow that capital into growth initiatives with the promise of even higher valuations and more capital ahead. This relationship was quantifiable in the public markets, as high-growth companies were consistently rewarded with the biggest multiples. 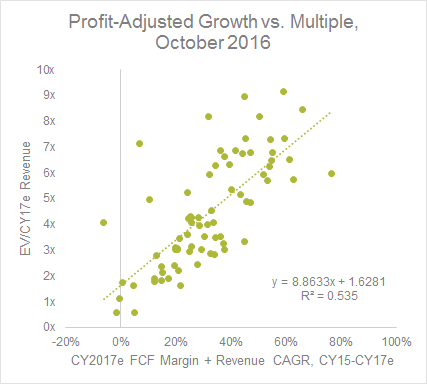 On the other hand, company profitability had little-to-no impact on revenue multiples. As a result, companies had lots of incentive to grow as fast as possible, and little incentive to focus on profits. Growth alone is no longer a reliable predictor of valuation. The laser focus on growth had an observable effect on company behavior, as well. Many companies decided to push out profitability and accelerate hiring plans, particularly in sales. For our sample group of public software companies, the average projected free cash flow margin dropped from 20 percent in 2012 and 2013 to only 14 percent in 2014 and 2015 as growth efforts took center stage. However, the ultimate benefit from these investments was debatable. The average expected revenue growth rate of the public software group showed little change, from 16 percent projected growth in 2012 and 2013 to 17 percent projected growth in 2014 and 2015. The takeaway: From 2010 to mid-2015, investors rewarded software companies for revenue growth with little attention to how much those companies spent to deliver that growth. Based on the data, there has been a quantifiable shift in investor thinking in private markets and public markets over the past year. 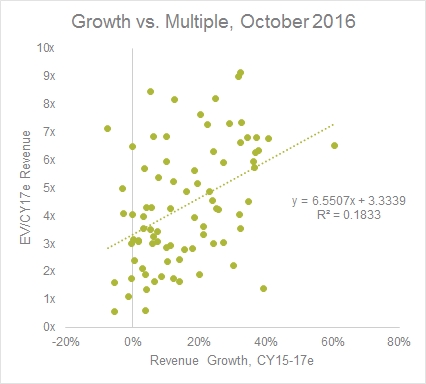 The correlation between revenue multiples and revenue growth has steadily weakened since the stock market volatility in mid-2015. Investors are less willing to value companies based on revenue growth alone, and are less willing to pay a sizeable premium for the highest-growth companies. Source: Geodesic Capital. Analysis based on 82 publicly traded software companies. The stock market has returned to record highs over the past year, and a recent string of successful tech IPOs is an encouraging sign for private company investors and entrepreneurs. However, despite the market recovery, the relationship between revenue growth and valuation remains weak. While the market sell-off in 2015 proved temporary, we believe a more conservative mindset will continue as investors question high rates of cash burn and are less willing to fund companies that use capital inefficiently. The takeaway: The stock market has returned to record highs, but investors have not returned to a growth-at-any-cost mentality for software companies. Growth alone is no longer a reliable predictor of valuation. In the second half of 2015, revenue growth declined as a driver of public software company valuations, while in the first half of 2016, profitability increased as a driver. Today, both factors carry importance — however, the best and most consistent predictor of valuation seems to be a combination of growth and profitability. To capture and quantify this, we focused on Profit-Adjusted Growth (PAG) metric, which is the sum of a company’s projected revenue growth rate and free cash flow margin. This approach aims to value growth in the context of company profitability. The current market is paying the highest multiples for companies delivering the most attractive balance between growth and profits, while discounting companies that exhibit high growth but at an outsized cost, or that aren’t generating sufficient profitability at lower rates of growth. The takeaway: Growth still matters, but profitability matters, as well. Companies delivering the best growth relative to company profitability will be rewarded with the best valuations. What does this mean for entrepreneurs today? For entrepreneurs, the message is to still invest in the business, but ensure that those investments are generating measurable business impact. If spending on sales doesn’t have the desired impact, the best answer may not be just to spend more, but rather evaluate whether there are better ways to spend. A business showing moderate growth but exceptional profitability may be just as valuable as a company growing faster than its peers but burning massive amounts of cash to achieve this. We believe the market today is in a healthier place, as investors reward entrepreneurs that use capital wisely and build for long-term success rather than short-term returns.